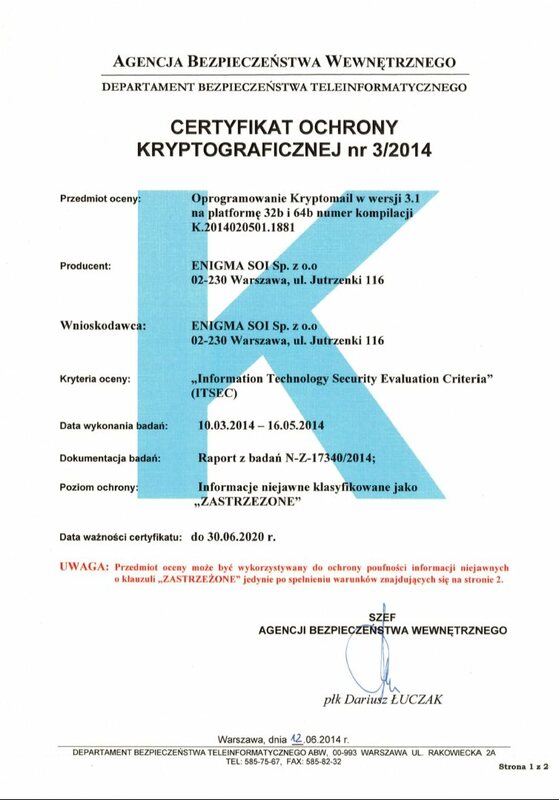 Certificate for the Kryptomail software designed for the protection of classified information constituting a trade secret rated as “Restricted”. Certificate valid until: 30 June 2020. 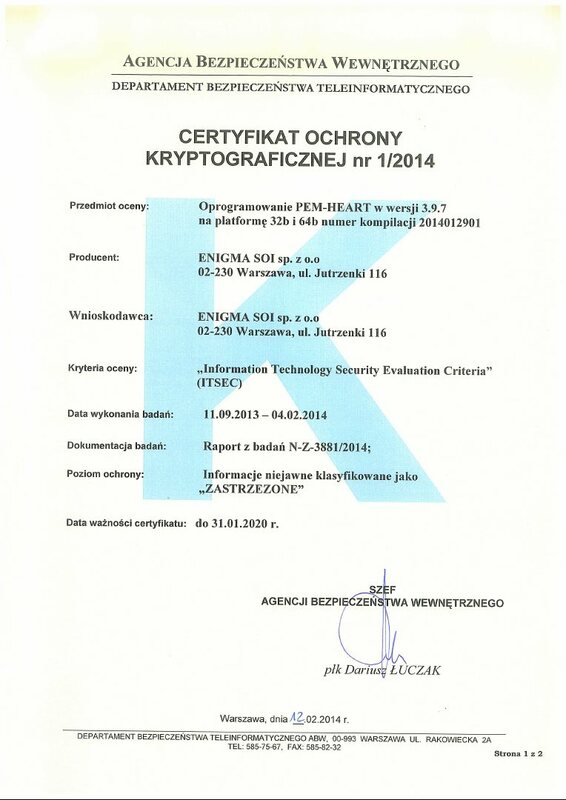 Certificate for the PEM-HEART 3.9.7 software designed for the protection of classified information constituting a trade secret rated as “Restricted”. Certificate valid until: 31 January 2020. 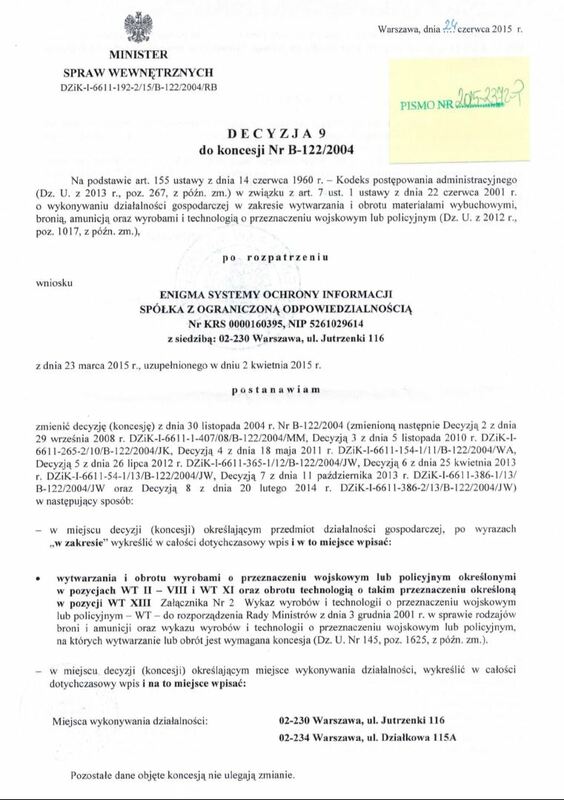 License of the Ministry of Internal Affairs for the production and marketing of products for military or police use specified in sections WTII-VIII, WT XI, and WT XIII. 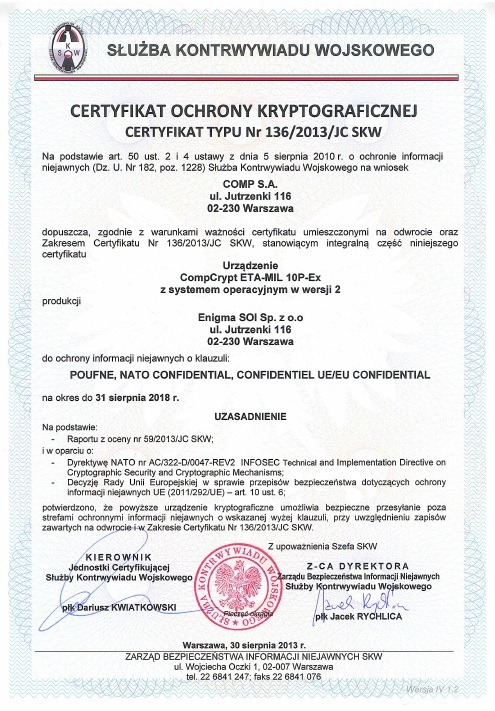 The CompCrypt ETA-MIL 10Z encryption device has passed the certification process and on 29 April 2014 was approved for the protection of classified information rated as RESTRICTED as well as of NATO information rated as NATO RESTRICTED and of European Union information rated as RESTREINT UE/EU RESTRICTED. Certificate valid until: 30 April 2019. 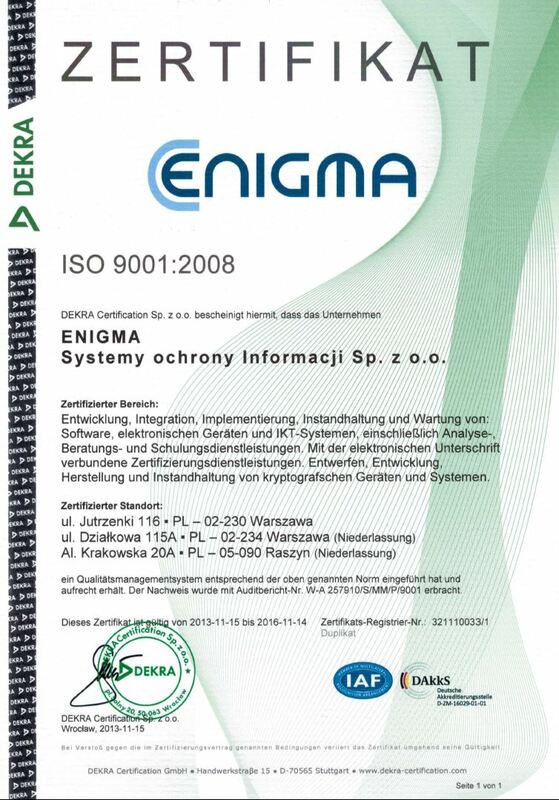 Certificate for the CompCrypt ETA-MIL 10P cryptographic device with the 2nd version operating system for the protection of classified information rated as CONFIDENTIAL/NATO CONFIDENTIAL/CONFIDENTIEL EU, issued to Enigma, a manufacturer of cryptographic devices. Certificate valid until: 31 August 2018. 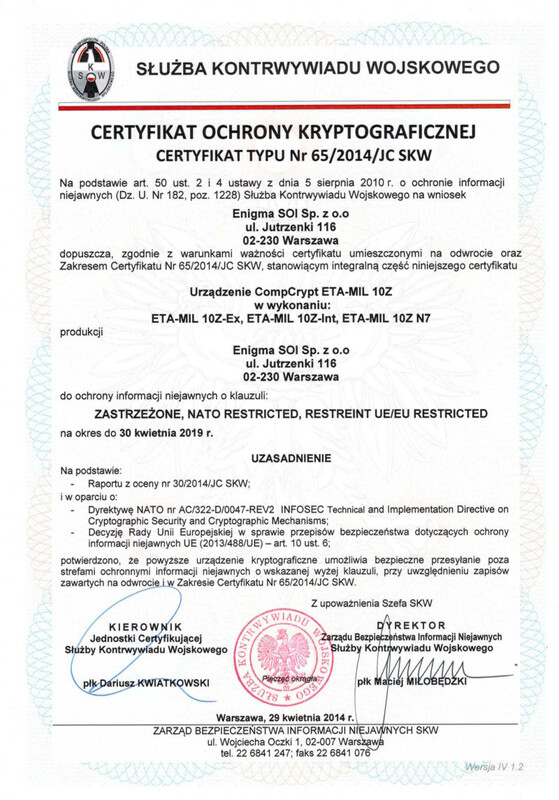 Certificate for the CompCrypt ETA-MIL 10P-Ex cryptographic device with the 2nd version operating system for the protection of classified information rated as CONFIDENTIAL/NATO CONFIDENTIAL/CONFIDENTIEL EU, issued to Enigma, a manufacturer of cryptographic devices. 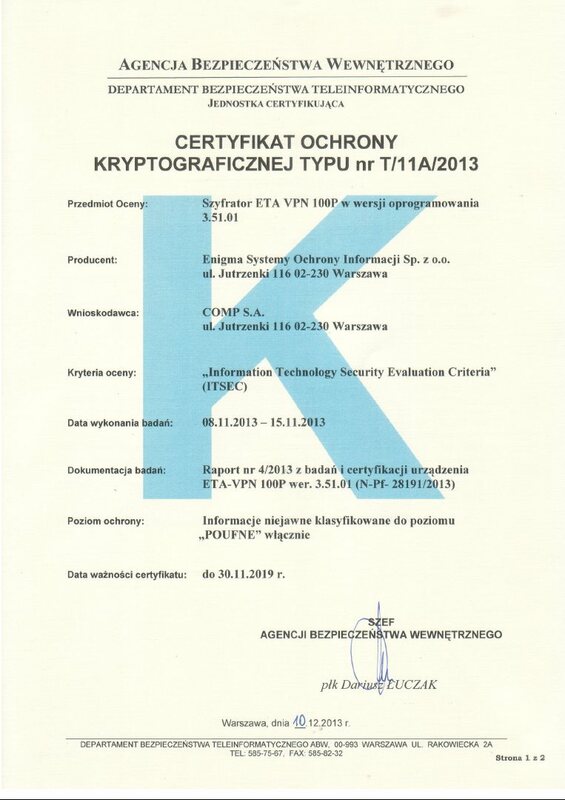 Certificate for the CompCrypt ETA-VPN 100P cryptographic device with the 3.51.05 version operating system, issued by the Department of ICT Security of the Internal Security Agency, to the company COMP, sold by Enigma. Certificate valid until: 30 November 2019. 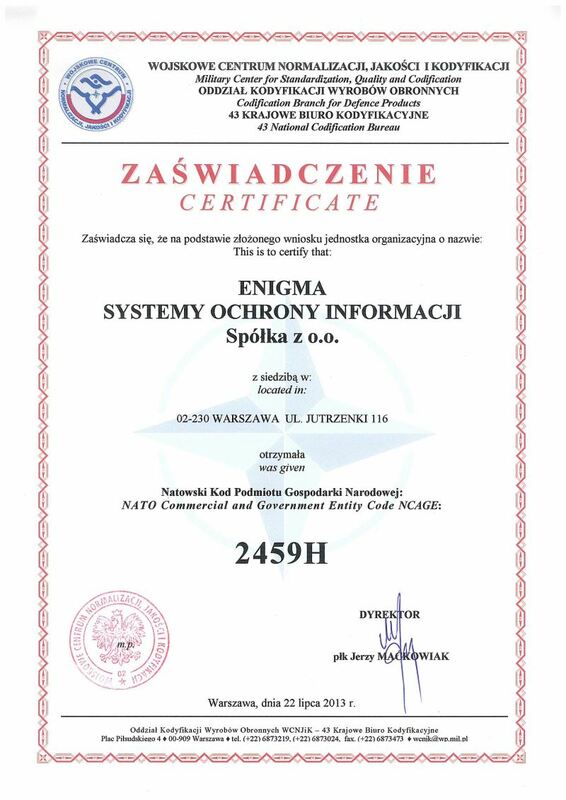 On 22 June 2013, the Military Centre for Standardization, Quality and Codification awarded Enigma Information Security Systems Sp. z o.o. 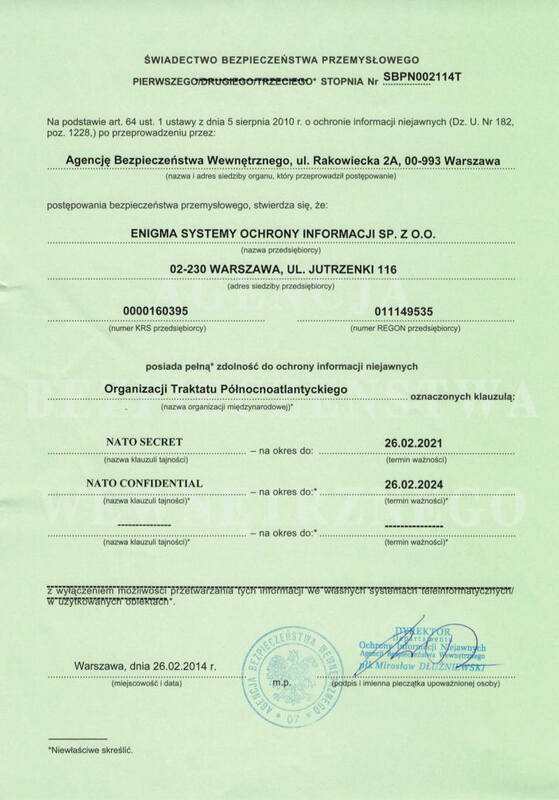 the NATO Commercial and Government Entity Code NCAGE: 2459H. 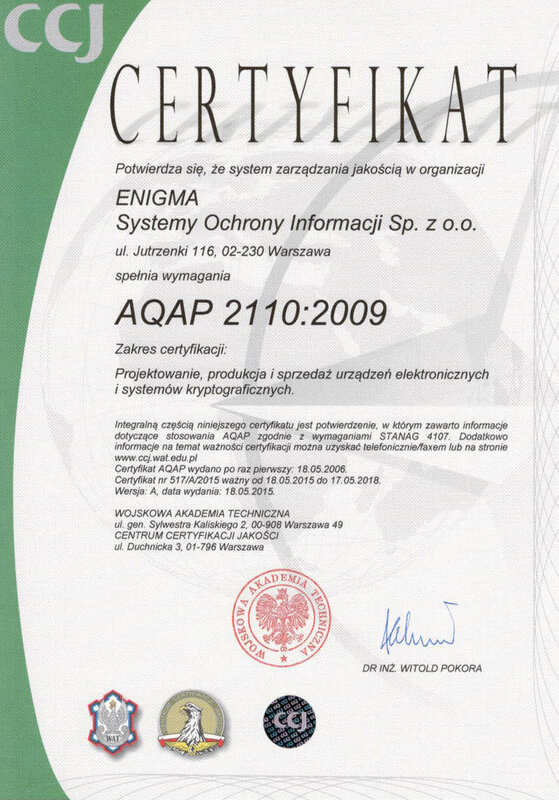 AQAP 21010:2009 Certificate for Enigma, covering the design, production and sale of electronic devices and cryptographic systems. Certificate valid until: 17 May 2018. 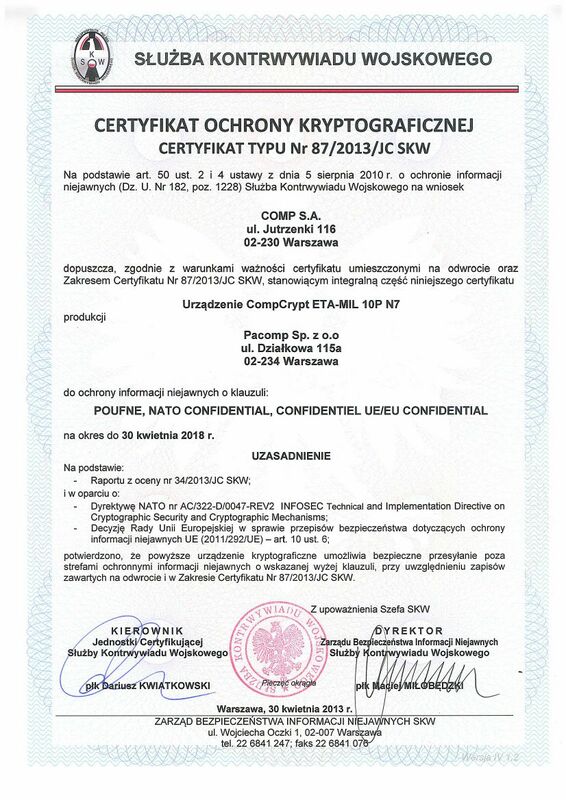 Certificate for the CompCrypt ETA-MIL 10P N7 cryptographic device for the protection of classified information rated as CONFIDENTIAL/NATO CONFIDENTIAL/CONFIDENTIEL UE/EU CONFIDENTIAL, manufactured by the company Pacomp and sold by Enigma. Certificate valid until: 30 April 2018. This certificate is valid until 6 January 2017. 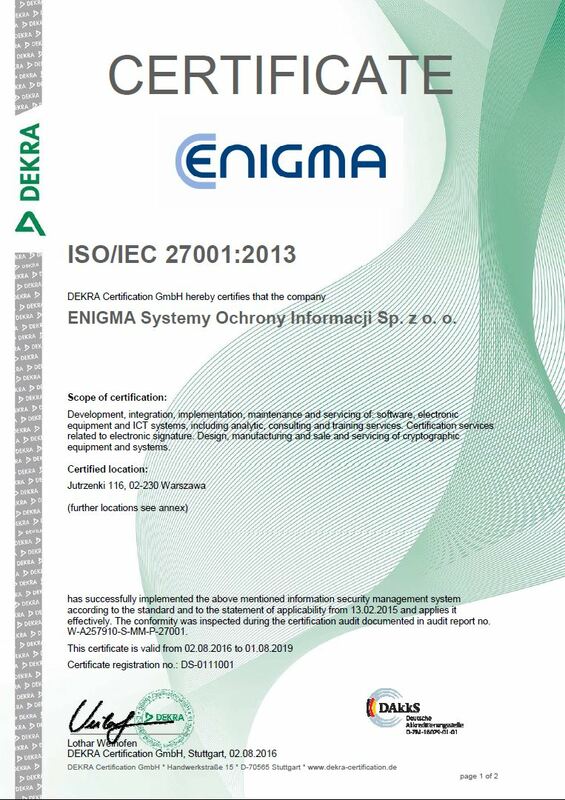 ISO 9001:2006 Certificate regarding: Design, integration, implementation, service and maintenance of IT systems and software, including analytical, consulting and training services as well as integration, implementation, service and maintenance of computer and networking hardware. Certificate valid until: 14 November 2016. Level 1 Industrial Security Certificate No. 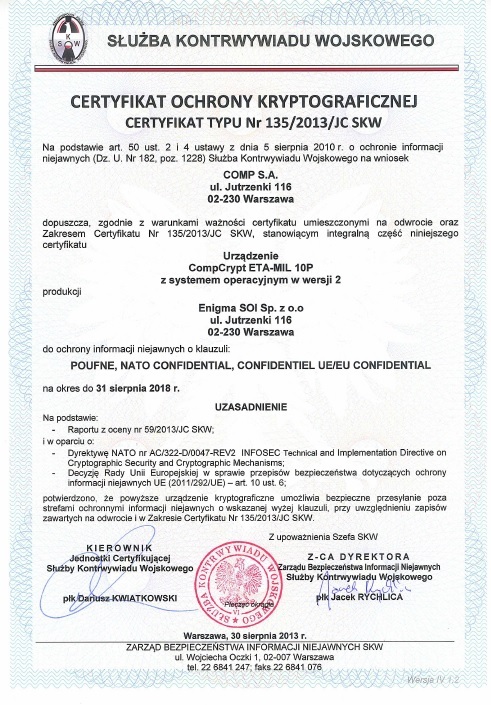 SBPN002114T to ensure the protection of classified information rated as “NATO SECRET” valid until 26 February 2021 and of classified information rated as “NATO CONFIDENTIAL” valid until 26 February 2024.